I’ve been wanting to mention this book to NLM readers for a long time, but with one thing and another, it's taken me a while to get to it. Angelico Press has recently republished a splendid Catholic novel from the 1940s, The Mass of Brother Michel, that I can highly recommend to those who enjoy historical fiction. The Mass of Brother Michel, set in the tranquil countryside of southern France during the Reformation, is the story of a young man who “has it all”—until a fateful series of events leads him to a monastery. As Huguenot violence mounts, the characters of the story are pushed to extremes of hatred and love. The reader is swept along by a narrative as twisting and turbulent as a mountain stream, which culminates in a sovereign sacrifice as unforgettable as it was unforeseen. This is a story that shows with utter vividness the power of romantic love to cripple and deform, the power of suffering to undermine illusions and induce the labor of self-discovery, the power of prayer to reassemble the shards of the shattered image of God in the soul, and the power of the priest as the divine Physician’s privileged instrument. At the center of the novel is the awesome mystery, scandal, consolation, and provocation of the Holy Sacrifice of the Mass. To it some of the characters are irresistibly drawn; against it, others are violently arrayed. Here is a passionately told tale of their inner struggle and outward confrontation. 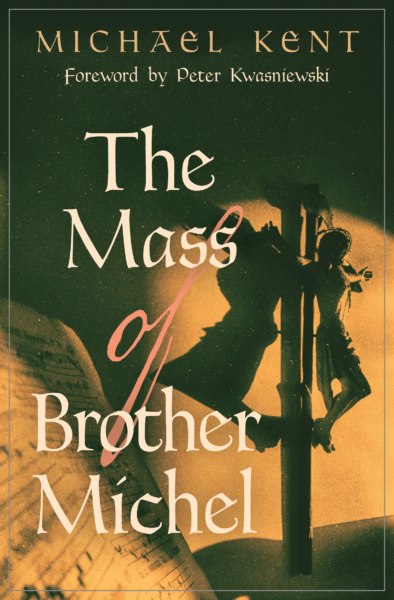 The Mass of Brother Michel is a gripping story of adventure, renunciation, redemption, and ultimate victory. No reader will fail to be astonished at its outcome and touched by its inspiring and miraculous climax. Every Crucifix was now a living figure. It was no longer necessary to dwell on the Passion of Our Lord as an essential part of his spiritual exercises. The Passion dwelt in him; engulfed him; possessed him with its agony, as the love of Mass had possessed him with its joy; nor were the two separate, but one, wearing only a different aspect, as light and darkness are both of the same day. For Michel could no longer be said to possess the love of Mass, but rather the love of Holy Mass possessed him. At first it had risen in his heart like a little stream, clear and singing and beautiful; now it was become a torrent, sweeping him along in full flood. I'd recommend this book for priests, religious, and laity, and in the last category, especially for high school and college students, and parents who are looking for excellent historical fiction to enrich a homeschool curriculum. It's on my list of the top ten "Catholic novels" (alongside Waugh's Brideshead Revisited, Greene's The Power and the Glory, and Cather's Death Comes for the Archbishop). The book is available from Amazon.com and affiliates.